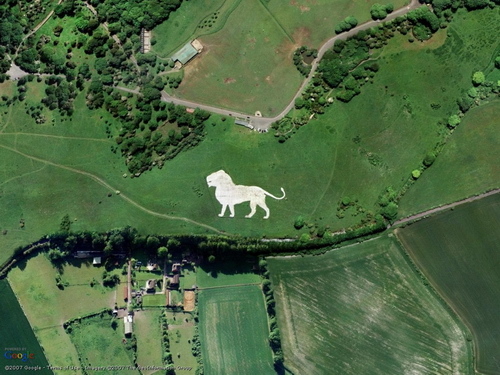 Here is a huge 150 metres long chalk lion on the slopes of Dunstable Downs, Bedfordshire, England. 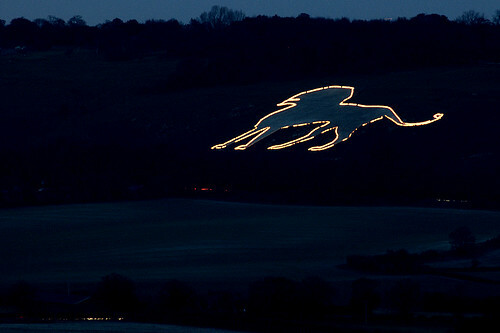 The artwork designed by Mr R B Brook-Greaves was carved into the chalky hillside to act as a way marker for the Whipsnade Wild Animal Park, commonly known as Whipsnade Zoo (officially - ZSL Whipsnade Zoo). 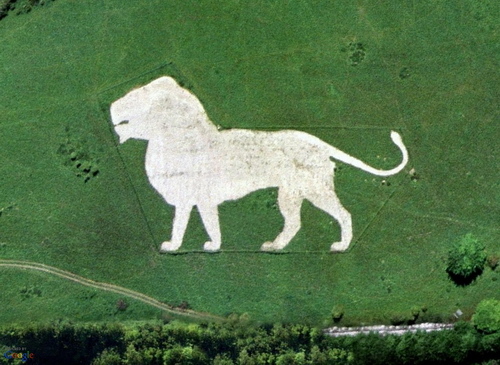 The lion was manually dug out with picks and shovels and was completed in Easter 1933. With aging and neglect the lion gradually started losing its shape and colour. However in 2005 it was restored by clearing of the debris and loose stones from the area. As a part of celebration of its restoration it was illuminated with 800 metres of white decorative light strings and and its nose was surrounded by red lights. I understand that the illumination in the evening is now a daily feature.